One of the most useful tools that we offer here at AJC Tools is our line of magnetic sweepers. These magnetic sweepers make cleaning up on any job site quick, easy, and painless. Say goodbye to the days of nails in your feet, metal shards in your hands, and flat tires on your trucks. AJC Tools offers three different varieties of magnetic sweepers - the AJC Rolling Magnetic Sweeper, AJC Handheld Magnetic Sweeper, and AJC Mini Magnetic Sweeper with Release. Each of these magnetic sweepers serves its own unique purpose around the job site to help make clean up a simple task. This model is our only available magnetic sweeper with wheels. 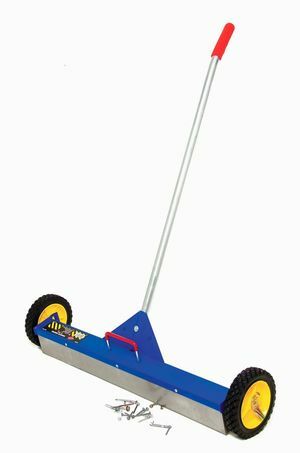 Featuring a heavier stainless steel box and wheel brackets, tool-free adjustable wheel height, and tough seven-inch diameter wheels, this sweeper is perfect for cleanup over large surface areas. Ideal for clean up in the grass, or other terrains that obstruct your view, this sweeper will pick up all those pesky nails and other debris in no time at all. This magnetic sweeper model also features a fold-over handle to make storage convenient. A spring loaded magnetic roof sweeper that features the quick release that is a favorite among roofers across the world. This magnetic sweeper is equipped with powerful magnets and a stainless steel box. Measuring ten inches of surface area this sweeper makes cleanup of your job site as simple as can be. This mini magnetic sweeper pick up tools is useful on nearly any job site you can imagine. It’s small stature, with a four-inch diameter, allows you to use it in a number of places and situations that you can not use one of our larger magnetic sweepers in. Perfect for loading a nail bag, removing nails from gutters after a job, cleaning up metal debris in confined spaces, and a number of other uses, this is a staple tool in any roofer’s arsenal. So they pick up nails, what other factors should you consider when looking at a magnetic sweeper? Well for starters, a good magnetic sweeper will save you a lot of pain, literally! If you’ve never had a nail jab into your foot or knee (and we don’t recommend the experience!) consider yourself lucky. Not only will it save you pain yourself, but they also protect the ones you care about. You won’t want to leave nails or debris laying all around a job site where children or pets will be running around after all! On top of all that they help protect you from lawsuits if you’re doing contract work and not a home repair for yourself. No nails left laying around means no injured people or pets and no popped tires, leaving you protected from having to pay for any damages caused by leftover debris of a job site. We highly recommend at least one of our magnetic sweepers be brought to any job site, if not multiple sweepers due to all of their helpful uses. If you have any questions about these products please do not hesitate to contact us!